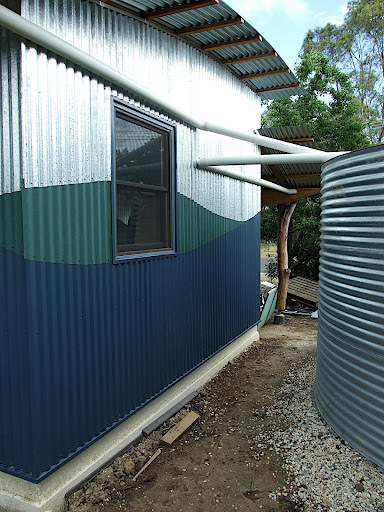 Permaculture and rain water harvesting. « Mudjadji the Rain Queen. I had the good fortune to attend a two day Introduction to Permaculture course, run by SEED at Rocklands Primary in Mitchell’s Plain. The course was looking at Permaculture in an urban environment, and was presnted by Jeremiah Kidd from Santa Fe, New Mexico. My understanding before the course was that Permaculture was an advanced method of growing organic vegetables; it was an embarrasing discovery for me to learn that I was very misinformed. But lucky for me, a discovery that Permaculture is far broader and has lots to offer. In a nutshell:Permaculture is a design philosophy from which to approach a sustainable lifestyle.There are common sense ehtics and principles that are applied to the sustainable use of natural resources. The principles and philosophies have been refined over the last 40 years, drawing from experience gleaned all over the world. Originally formulated by two Australians: Bill Mollison and David Holmgren, the word permaculture was originally a combination of permanent and agriculture. Later as the importance of people in this philosophy was realised, the culture part has come to refer to human culture as well. For me Permaculture appears to be a practical philosophy, encouraging action – but realising that for most of us, changing behaviour is best accomplished in small steps. Start small and expand as you grow in confidence and experience. Judging by the experienced permaculturists on the course and at SEED it is a way of life that slowly impacts on everything you do. Permaculture encourages the most efficient use of all resources and energy coming into your system, including water and solar energy. So for rain water, a permaculturist in a water scarce area will try to capture and use as much rainwater as possible. This is done with swales,dams,ponds and water tanks. 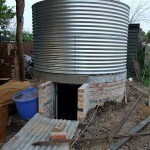 Efficient reuse of this water is vital and water is reused as grey water.